Proiphys amboinensis (Cardwell Lily, Northern Christmas Lily) really had us intrigued when it flowered for the first time last April after 7 years and sent me on a search mission for its correct ID.! An attractive foliage plant with large heart-shaped green-coloured leaves, embossed with lovely venation and will produce fabulous white blossoms unexpectedly to amaze you! 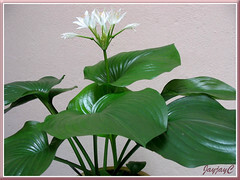 b) Producing bulbils or new plants rather than seed, as in the tiger lily. Armed with the hope of seeing such a phenomenon which was new to me, I took the challenge and endeavoured to make it possible. Sadly, it didn’t materialize as anticipated, that is, the seeds in the fruits that developed after flowering did not germinate while on the plant itself. Nature has its own design. Nevertheless, we were delighted with the successful outcome of our propagating project where we got a new Cardwell Lily plant by germinating a single seedpod. 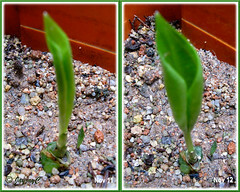 The whole propagation process of Proiphys amboinensis took about 6 months. Slightly more than half a year? Unbelievable, huh! Not for the impatient gardener, for sure! We too were absolutely surprised. The fruits seemed never wanting to mature, preferring to remain young and green forever! With no knowledge whatsoever on how-to or when to harvest the seeds and plant them, we just had to do it by instincts. No online literature was available as a guide, so it was just a trial and error affair! May 1 – flowers were allowed to naturally develop into globular-shaped fruits or seedpods, that were smooth, glossy and dark green in colour, measuring 2-3 cm across. Withered flowers were left as they were to dry up. Initially, I did pull one off but noticed its filament extending inside the seedpod. Thus, didn’t repeat for the rest, just in case it had a purpose there. As I’ve mentioned above, we were clueless on what to expect, being our first attempt and no material could be sourced online for direction. Though our flowers started to set fruits as early as May 1st, the majority of fruits dropped before month-end and only 2 remained attached two months later. What a disappointment! Size of fruit increased very gradually during the whole time and you can see that the green shade had darkened but still remained unripened. 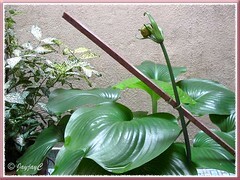 June – the flowering scape, 60 cm long was unable to hold firm and support itself. As early as June, we had it staked as we didn’t want to risk loosing those precious seedpods. But, it was beyond our control as no matter how careful we tried, the plant has the final say. Inevitably, only one seedpod was hers to give. August 8 – within 3 months after the fruits were first produced, all but one didn’t drop. We were unsure whether the remaining seedpod will mature to a different shade at all, as it seemed to be forever clothed in dark green. Was it time to harvest for germination? We decided to follow our gardening instincts and experience and let it be. September 13 – the long-awaited seedpod was finally ready for propagation! But, we weren’t! Uncertainties surfaced! Is it a seedpod containing seeds within or is it a whole seed that has to be dried and shriveled before planting? If a seedpod, has it to be cut open to remove the seeds! What if we are wrong in our assumptions and had sacrificed the only one there is, our whole experiment will go up in flames! Oh dear, what should we do! John left the decision to me since it was my baby from the start. Well, since Cardwell Lily is a bulbous plant, I just followed my instinct to sow the freshly fallen seedpod right away into a pot filled with moist well-drained garden soil, as you would a bulb. That was, being mindful that its topside (where the flowers were previously attached) remained above the soil, and ensure that half to one-third of it exposed, as seen in the photo below. Then, locate it at a bright site with filtered sunlight, and water lightly every other day. 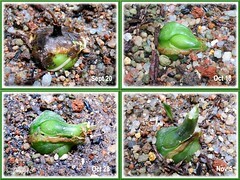 September 20 onwards – a week later, some of the outer covering had fallen to expose a green section and an encircling root. We were so excited to see these significant signs of growth. 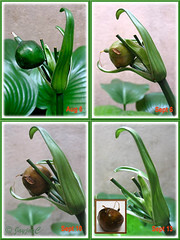 The picture below shows the gradual sequence of the seed’s germination and by November 5, the main body had developed an upward projection where a shoot would emerge. You can see a small shoot had sprouted beside it too. Apparently, it germinated from one of the other seeds contained in the same seedpod. November 11 – hooray! A sprout had finally emerged to say hello! Welcome to the world, our precious baby! November 15 – by the fourth day, it had shot 17 cm tall, what a beauty! Can you detect 2 more shoots beside it? Funny that they are still so tiny in comparison, in spite of one of them having emerged even before the tallest sister! Well, we’ll just wait and see their progress. We’ve read that plants propagated from seed are not genetically the same as the parent plant…we’ll observe this too. The whole experiment had been so wonderful! We’re absolutely thrilled with our success. Know more about Cardwell Lily’s profile here, if you’re interested. An easier alternative method of propagating Cardwell Lily is by division of bulb offsets – learn how-to here. I am so happy to see the ‘birth’. Congratulations on a job well done. You have persevered and finally reaped the rewards. I can understand how excited you must be. Cheers to you. Fascinating! I love the propagation process, of just about all plants. I have seen the process of seeds germinating while still on the parent plant before. Many crops in the field will do this if we have a rain when they are ready to harvest. Also, zinnia in my flowerbeds have done this, and native lantana was the last thing I saw doing it. It is more common than you would think. That is a really pretty lily, although not something I would have easily said was a lily. I am not familiar with it at all, but I love that foliage! Autumn Belle – thank you so much for your visits and kind comments! 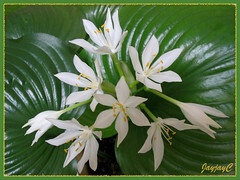 Janie – thanks a lot for visiting and thoughtful comments! Appreciate your sharing and insights on the process of seeds germinating prematurely on various plants. We’ve never seen this before. The closest example I can recall was seeing new plants emerged on the flowerheads of our Alpinia purpurata (Red Ginger Lily) a long time ago. hello Jacqueline, i smiled a bit on your step-by-step narration and patience in waiting for your seed to mature and finally its germination. So we realized it is seed maturation which took almost 5 months but only 1 wk to germinate. I am not familiar with this plant though i have seen it, but it becomes more fascinating and i became curious with your tale. I remember my experiments of germinating cycad seeds which was almost a year, and i didn’t even know if they are still alive. Thank you also for visiting my blog and leading me to Pereskia corrugata. How is your son now? Good thing you have decided to bury the whole seedpod and consider it like a bulb. I would definitely made that error in cutting that friut into half thinking there is seeds inside. And patience is a virtue I yet to have, I would have settled for offsets from the parent plant. You certainly have that grace to endure in seeing this plant for 7 months. Truly that’s considered something great. Thank God that my curiosity and endurance got the better of me and I’ve this wonderful experience to share. Moreover, since my google search for literature on its propagation was futile, that gave me the impetus to do something in my own small way, for others who could be seeking for answers too. Thank you so much for visiting and your much appreciated uplifting comments. I have had this Lily for years and when we sold up got carried away and gave friends bulbs (silly me). My plant has now lessened to about 5 bulbs and are very small. I am heartbroken as when in Hervey Bay on my back porch facing due north the leaves were magnificient. One friend ,his was in flower when I gave it to him. Sometimes we gardeners are a little generous, particularly if the friend tells you , what you have given them has died. I am now looking out for new bulbs. we are now able to benefit with a history of the Lily. I have only known it as a Cardwell lily or Brisbane lily. 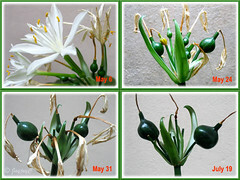 We had a similar experience with our first pot of Cardwell Lily. The plants were thriving so well, but we split them to share some bulbs with my brother and sister, leaving only 2 bulbs for ourselves. They almost died but fortunately revived eventually. Since then, we’d rather leave them potbound and had never dared to repot or split them. Our tropical climate seems to be very conducive for our plant’s luxuriant growth. It surprised us with a second flowering last April and we managed to germinate another plant again in September. Thanks for sharing your experience of this beauty. May you be successful in procuring more bulbs to enjoy its loveliness. I was so excited to find this information. I too have been given some seed pods & have searched high & low for information. Thankyou for sharing your experience. Hopefully I will have success also. You’re most welcome, Donna… I love sharing! Wish you much success in your venture. Nature is so wonderful. Thanks for the detailed description of how you raised the plant from its seed. 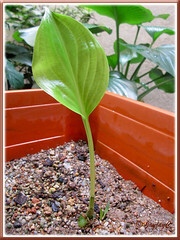 I have some interest in growing plants from seeds as the new plants are likely to be different from the mother plant. I have raised some hibiscus, adenium and pelargonium, among others. I am seriously thinking of creating a new website and post all those experiences.